We highly recommend the proper use of a crate to aid in housebreaking the puppy, and to prevent destructive chewing when you’re not watching. We prefer the fiberglass Vari-Kennels to wire crates, as they are more den-like and many dogs feel more secure. Also we have found them safer as an avid chewer can do serious damage to teeth by chewing the bars of a wire crate (though we have also seen avid chewers do damage to Vari-Kennels too!). The Vari-Kennel 400 is the size we use for our Beardies. It measures 36”L x 24”W x 26”H. 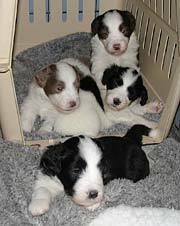 Beardie puppies grow very rapidly so it would be a waste of money to purchase a smaller crate initially, as the pup may outgrow it in just a few months. An ex-pen is a fold-up wire enclosure, generally consisting of 8, 2’ wide panels. An ex-pen comes in very handy if the pup must be left alone for long periods - too long a time to be kept confined to a crate - such as when its owners are at work. The pen provides a secure enclosure, large enough that the pup can stretch his legs and move around a bit, and gives you the peace of mind that the pup is safe and not getting into trouble. During housetraining the pen gives the pup enough space that if he can’t yet hold it and must go to the bathroom, he is not forced to sit in it as he would be in a crate. This is important because if the pup becomes used to lying in his mess, which goes against his natural inclination to be clean, he will be much harder to housetrain. Ex-pens come in various heights, but we use the 42”H ones. Every dog needs these, and there are dozens of styles to choose from. Keep in mind that the leash should be comfortable in your hand so avoid those made of chain, or those that are very thin. 1/2” or 3/4” flat nylon or leather leashes, with a length of about 6’ are best. Flexi-leashes, retractable leashes that extend to 20’ or more, are great for giving your dog a bit more freedom to romp, for instance in a park, without the danger of him/her being off leash. If you have never used one before, practice until you are comfortable with it before using it with your dog. If you are unable to quickly retract it, it just becomes a very long leash which can get tangled around things, and can be dangerous if your dog is headed towards something harmful (eg. the road, an aggressive dog, a person who doesn’t like dogs, etc.) and you are unable to properly use the leash to stop him/her. Also, the standard flexi leads use a fairly thin round line which can cause injury if it gets wrapped around your leg or you inadvertently try to grab it in an emergency. Some newer ones use flat 1/2" nylon for the whole line which is much better. Many dog owners use a 1/2” or 3/4” flat nylon, quick-release, adjustable collar. They’re great for pups who grow by the day, and probably do the least damage, either breakage or matting, to adult coats. The only drawback is that should the dog be seriously startled there is the possibility of him/her backing out of the collar. Plus I’ve found I often trap hair in the snap when I’m putting them on. For these reasons my favourite collar is called a nylon Premier collar. This is a flat nylon adjustable martingale style collar, which slips over the dog’s head and tightens enough to be secure if the dog tries to back out but not enough to choke. They are available in the US from J & J Dog Supply, and are available locally here in Ottawa from a couple of sources. Another collar widely favoured by Beardie owners is the White Pine 9/16" soft slip collars. They are made of a parachute type material which slips nicely over the coat, unlike many collars which will break coat or cause tangles if left on for long periods. They are available direct from the company at White Pine Outfitters, or in Canada they can be ordered from Pawsazz. Some Beardies can have a reaction to plastic dishes, resulting in loss of pigment on their nose and lips. For this reason, and for ease of cleaning and prevention of bacteria growth, we prefer stainless steel dishes. When purchasing toys for your dog, safety should be the primary concern. We have found the safest, sturdiest toys to be: rubber Kong toys (and now bones, balls, and other shapes made from the same super strong rubber), large marrow bones, Nylabones, Galileo bones, and knotted rope toys. The Kong toys and marrow bones can be made more interesting by putting peanut butter, liverwurst, or cheez-whiz inside them. Depending on how destructive or avid a chewer your dog is, other toys that may be fine are stuffed toys, Gumabones, rubber tugs or rings, or large sturdy vinyl squeaky toys. Some Beardies will be gentle with the latter bunch of toys, while others will demolish them quickly and can swallow pieces of them, which can be dangerous. Keep in mind that with the very hard toys such as marrow bones and Galileo bones can cause tooth wear or possibly breakage in aggressive chewers, and some dogs can chew sharp 'splinters' off of certain marrow bones, which can be potentially dangerous if swallowed. This is a substantial and informative publication on the breed. Not a step by step training book, this book is about the relationship between humans and dogs, and the common misconceptions that often lead to problems. This book will help you understand how dogs think and learn, giving you the ‘dog sense’ necessary to raise a well-behaved dog and develop a good relationship with him. Not specifically a how-to dog-training book, this book discusses operant conditioning, the basis behind clicker training, and how it can be successfully applied to both people and dogs to ‘shape’ the behaviour you desire. A wonderful little book about the body language dogs use to communicate with each other, and with us, particularly the little behaviours that indicate the dog is stressed or upset, and how to use these signals yourself to communicate with your dog. A super book on the body language dogs use and what it means. Many problems occur when owners simply don’t understand what their dog is trying to tell them through their behavioural displays and body language. Using many case histories, this book will teach you how to better ’read’ your dog and respond appropriately.